From the #1 Bestselling Author of Time Travel Romance for A CHRISTMAS IN TIME: A Breathtaking Victorian Paranormal Romance! 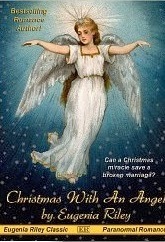 CAN A CHRISTMAS MIRACLE SAVE A BROKEN MARRIAGE? In 1850’s London, Nathan Fletcher has driven away his dear wife Emily through his resentment of their arranged marriage. On Christmas Eve, he is finally coming to his senses and realizing how much she means to him, when he learns the dreadful news that she has left him forever. Then a devastating cable arrives stating that Emily is presumed drowned after her ship went down off the Channel. Nathan is at the point of total despair, when a miracle occurs: Emily appears on his doorstep! But this is not the real Emily but Emily’s angel, dispatched from Heaven for just one day to be with Nathan, so the two of them may resolve their troubled marriage before she travels on to the celestial plane. Even as Nathan reels at the knowledge that he will soon lose his bride again, he and Emily embark on a magical journey together, into the countryside and into their marriage. In the enchanting village of Avalon, they discover the real meaning of home, family, and community, as well as the true spirit of Christmas. Even as the couple reawakens their lost love, Nathan knows Emily must leave him again, before Christmas even arrives. Has he rediscovered his precious wife, only to lose her forever? Or is a second Christmas miracle too much to hope for? Has Nathan found his beloved bride, only to lose her forever? Emily’s smile was all the encouragement Nathan needed. He leaned over and caught her lips tenderly, reverently, trying to communicate through his kiss just how precious she was to him. Her lips tasted warm, sweet, so human, and her womanly curves felt so soft and real against him. Sweet Lord, what exquisite torment it was to hold her this way! He could not believe she was here in his arms but he would have her for such a short time. Why had he never appreciated her before, or seen what a priceless jewel she truly was? He could experience that splendor only now, for this one magical day, and he must try not to allow his terrible guilt and fear to cloud their remaining time together . . .
Emily, too, savored every sensation as Nathan kissed her—the strength of his embrace, his male scent, the heat of his lips on hers. Before, Nathan had always kissed her with arrogance, with passion, even with anger. But now, he wasn’t just taking from her . . . she could tell he was truly giving of himself. Anguish choked her. Why couldn’t they have known such glory, such true intimacy, before during their marriage? Why was she being given, at last, the gift of her husband’s devotion, only to have it snatched away? Was it only her death that could bring them together?